Akiba Rubinstein was born December 12, 1882 in Stawisk, Poland. He first learned chess in school where he played his classmates. He gave up theological studies for a professional chess career in 1903 when he placed 5th at a tournament in Kiev. As you study his many historical achievements, keep in mind that Akiba Rubinstein had a nervous disorder known as anthropophobia (fear of people and society) for his entire life. His poor mental health was clearly an extremely difficult disability for him to contend with and caused him enormous suffering throughout his life. But, inspite of his disability, Akiba Rubinstein was able to compete brilliantly for many years with the best chess players in the world and his games are studied and treasured to this day. Rubinstein was a powerful force to contend with between 1907 and 1912. 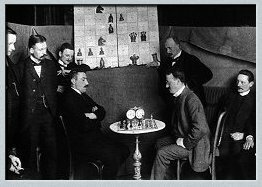 In 1910 when Schlecter challenged Lasker for the World Champion title, many considered Rubinstein to be the best chess player in the world. In those days the challenger to the World Champion was required to raise the money and finance the match. The World Champion alone would decide which challenger to play and this was largely based on the funding available. Rubinstein never had a chance to play for the Chess World Championship but he is considered the strongest player who did not have the opportunity to compete for the title. Rubinstein was increasingly troubled by his mental illness and in 1911 he complained of a fly that continually disrupted his concentration during tournaments. When asked if he was all right he said, "Oh I'm fine, I just need to see a doctor about this fly". Also during this time it was difficult to visit Rubinstein in his home. His wife warned many potential visitors, "Do not stay long, for if you do stay too long he will leave by way of the window." Watson: "You are afraid of something?" Holmes: "Well I am. ... I think you know me well enough Watson, to understand that I am by no means a nervous man. At the same time, it is stupidity rather than courage to refuse to recognize danger when it is close upon you. I must further beg you to be so unconventional as to allow me to leave your house presently by scrambling over your back garden wall." In 1912 Rubinstein achieved an amazing feat; he won five consecutive international tournaments. This had never been done before in the history of chess! Fifty years later Bent Larsen won five tournaments in a row, however it took him 3 years to achieve this while Rubinstein won at San Sebastian, Pistyan, Breslau, Warsaw and Vilna all in the same year. In 1914 Nicholas II, the Czar of Russia, organized a tournament in St. Petersburg and invited all the greatest players in the world. The top five finishers would be given the title "Grandmaster". Tragically, Rubinstein failed to qualify in the top five. After World War I, Rubinstein continued to play in tournaments with moderate success but he did not revisit his former high level of play until he won the Vienna tournament in 1922, ahead of Alexander Alekhine and Richard Reti. After 1932, Rubinstein never competed in chess tournaments again, although he was invited to do so. His lifelong struggle with his mental health worsened and he spent time in a sanitarium. However, there was a bright side to this because it is possible that this protected him from the Germans during World War II and he was left alone. Two of his most famous games were played against Emanuel Lasker and Jose Capablanca in tournaments that the latter two eventually won. In both games he made exactly the same move, to win, RC1. What are the odds of this happening?! Among the chess players who deserve our highest reverence, Akiba Rubinstein stands out as a unique contributor to chess. His noble career and life of great suffering stands as a beacon of light to all who study the game of chess as well as those who study life itself. One of Rubinstein's most notable games, this was Capablanca's only loss in the tournament. Incredibly, Rubinstein used the same move Rc1 that he used against Dr. Lasker in 1909 to win against Capablanca. The very first time Rubinstein played Dr. Lasker, Capablanca and Dr. Alekhine he demolished them. That's three World Chess Champions he beat the first time he played them. Obviously it was the fly on Rubinstein's forehead that intimidated them.